younganddomestic | Welcome to the Young and Domestic. Watch us renovate! That’s a wrap! Thirty days of Country Heat is in the books! Not only was it surprisingly fun, but I am happy to also report 3.5 lbs down and 4.5 more inches gone, 1.5 of those from my waist alone. 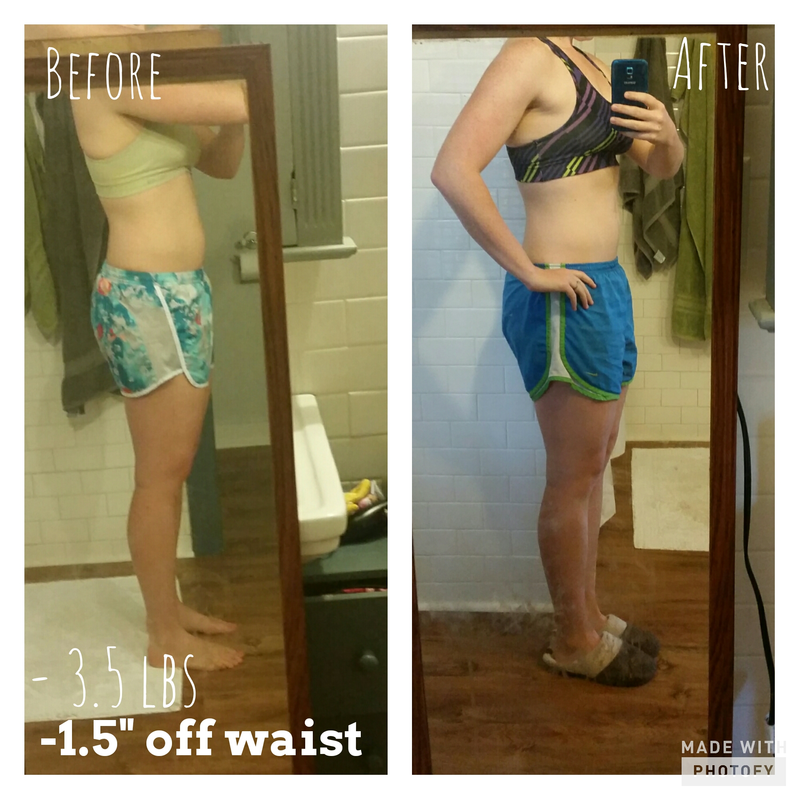 I was pretty shocked about the change in my waist! NOT A SINGLE TRADITIONAL CRUNCH OR SIT UP IN THIRTY DAYS!!!! It was all from engaging my core while dancing. Seriously, how cool is that?! The rest of week three is spent rotating through previous routines, and again has two days with extra dance conditioning. For the love, DANCE CONDITIONING IS HARD. It’s a nice mix of dancing, barre, and pilates. WHEW. BURNS SO GOOD. I will confess that week three fell on Halloween, so my nutrition wasn’t super stellar. Honestly, it wasn’t Halloween itself. I totally planned on using one of my yellow containers as a treat and have a few pieces of fun size candy, which I totally did. It was the entire week after Halloween when my husband was working 12 hour days and there was a pile of chocolate in the house that caused some issues. Oops. 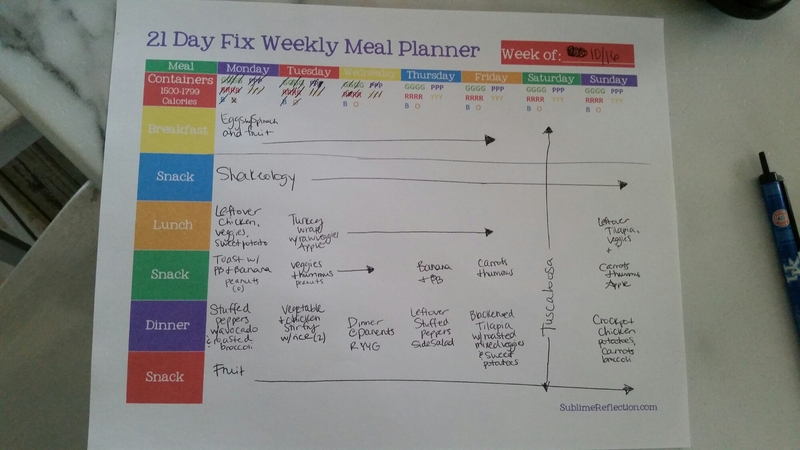 Nutrition wise, I was back on track for week four. 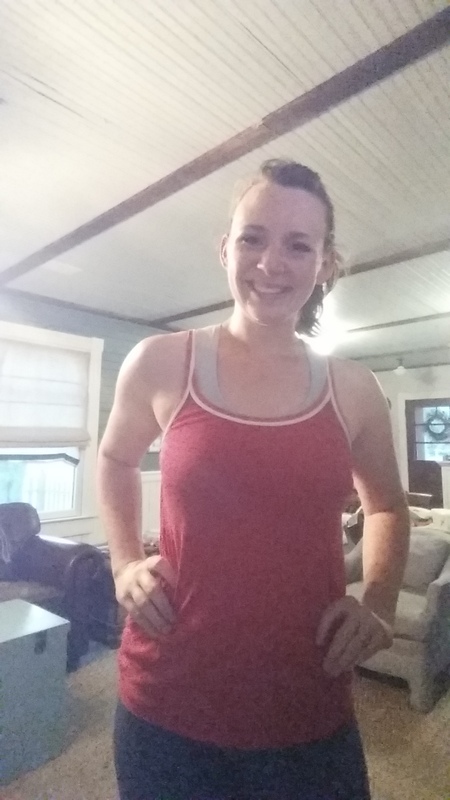 I actually timed doing this program really well because during week four, there were two NEW dances released on Beachbody on Demand, so instead of repeating previous routines, I gave those a try. I stuck to the pattern of doing each program two days in a row. Now, everyone loves a good before and after photo, right?! Well, here ya go! My waist was the biggest change for sure! AND NO CRUNCHES! Take that husband for rolling your eyes at my “little dance workout.” Over all, I lost four and a half inches. I have no doubt if I hadn’t slacked off my nutrition Halloween week I could have seen even better results! Looking to get started on their health journey but is intimidated by the thought of “traditional” exercise. Wants to exercise but has knee or back issues and needs something low impact. Who is in shape, but needing a change in routine. A recently postpartum mom who is looking for a gentle way to regain core strength. Likes the idea of cardio that does not include running or burpees. 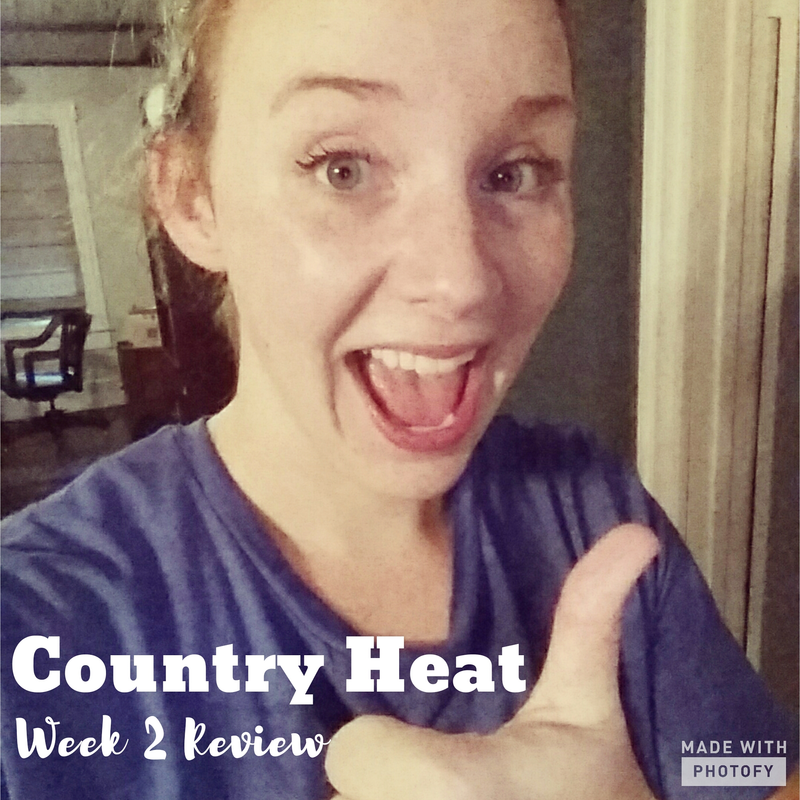 Country Heat is a FUN and low impact option cardio option that anyone can do! If you would like your own copy of Country Heat, you can get it here. This week consisted of two new routines, Down and Dirty and Bring the Heat, as well as two days of additional Dance Conditioning. Just like the first week (see review here), the week alternated between the two routines and also added Dance Conditioning on Tuesday and Saturday. Overall, I am enjoying Country Heat much more than I thought I would!! It really is a fun way to get in some cardio while still working you core. My obliques have never been this sore!! Also, Dance Conditioning is no joke! My booty and hamstrings were on fire!! I definitely recommend not skipping the extra conditioning. I stuck to the meal plan much better this past week and can feel a difference in my blue jeans. My skinniest jeans (we all have those right?!) fit better than when I bought them! The scale was also down 2 lbs this week bringing my total weight loss so far to 2.5 lbs. I will wait and take pictures and measurements at the end of 30 days. 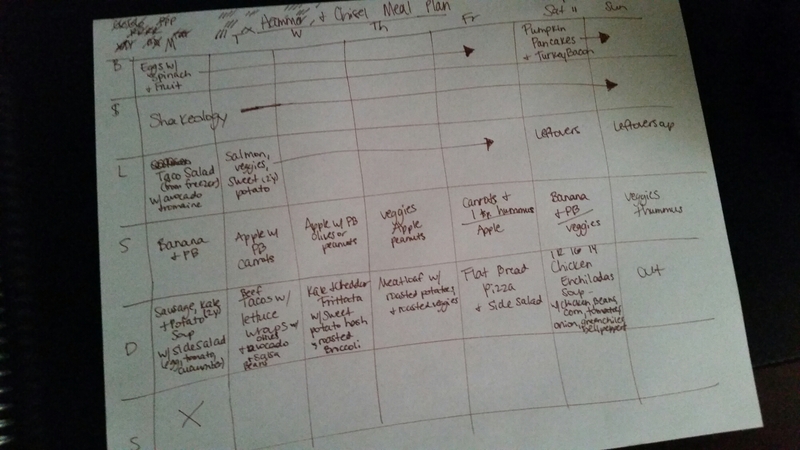 Here is a peak at my meal plan. Pardon my chicken scratch! I am in the 1500-1800 bracket and never struggled with being hungry this past week. Did I want a sweet treat after dinner sometimes? Absolutely! Hungry? Nope! I love how easy the portion fix system is to follow! I just make my plan based on my calorie bracket, stick it on the fridge, and that’s it. No calorie or point counting, which I personally find exhausting. Country Heat is on sale through the end of October, so you still have time to snag a good deal. You can check it out here. Thank you for all of the positive feedback about the things we are not doing this fall. One thing I am continuing this fall is to keep chugging along with my fitness journey. A lot of you who know me in “real life” know that I have successfully lost weight this year (almost 25 lbs now). After my son was born, I spent a few months extremely frustrated that the weight wasn’t magically going away like it had with my first child. Counting calories was exhausting, even with an app, and trying to take two children under two to a gym (with childcare) was an all morning event. Not to mention, my children were sick every other week! All of my frustration lead me to try a program called 21 Day Fix. It actually took me four months to FINALLY pull the trigger and order it, but within only three weeks (7 lbs and 10 inches gone) I was SOLD forever on these products. I love the simplicity of the meal plan and the ability to get a great workout in from the comfort of my home without dragging my children to the gym or needing a ton of equipment or space. Over the course of this year I have completed several rounds of 21 Day Fix, 21 Day Fix Extreme, as well as 22 Minute Hard Corps. I grew up an athlete, primarily playing basketball; however, I did have a VERY brief gymnastic phase in which my goals of being an Olympic gymnast were crushed at the early age of seven because I was already the height of an Olympian. *womp womp* Thankfully my sweet parents encouraged me to consider options where my height could be used to my advantage! I have always enjoyed “traditional exercise” and have never been interested in dance type workouts like Zumba or Cize, mostly out of fear of just looking dumb. So when Country Heat was announced earlier this year, my first thought was, “This must be a PRANK.” Not. Even. Joking. I thought it was the dumbest thing I had EVER heard. Line dancing? To country music? As cardio? For real?! Nope. Nope. Nope. Well, it wasn’t a prank lol I was the stuck up fitness snob who thought “real” cardio and traditional strength training was the only to see REAL results!! I am so happy to say that I was WRONG!! This is one of my friends and accountability group buddies who just finished Country Heat. 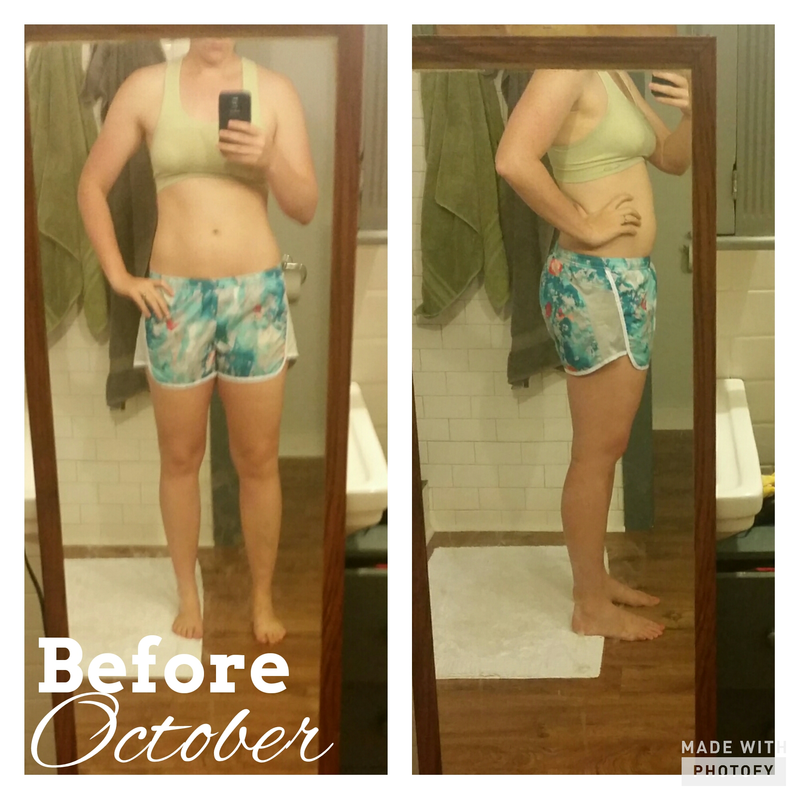 In three weeks, she lost 6.6 lbs and 4 INCHES OFF HER WAIST!! BY DANCING and watching her nutrition. 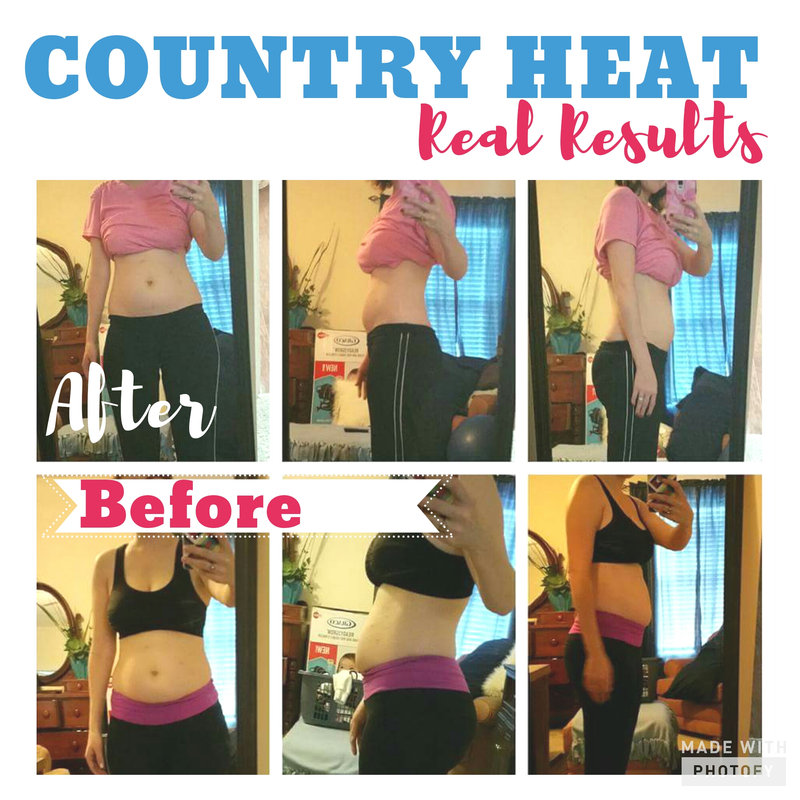 Coming off of a tough program, I was worried Country Heat might not help me continue towards my goals, but again I was WRONG. My abs and back are sore in places I didn’t know I had lol Seeing my friend make progress (and all the fun she had with her kiddos) gave me the courage to give it a try. Another great thing about this that is different from other dance programs is you don’t have to memorize an entire routine. It is broken down to two moves at a time. You complete those two moves and move on to two more. Nothing super long or complicated! My nutrition hasn’t been 100% on point because we had some family in town Monday and Tuesday and two church events on Sunday, but I did stick to the meal plan well during the rest of the week. Even with an iffy start food wise, I still lost 1/2 lb. this first week. I already have a better plan for this week, and I am looking forward to new routines! I will be back next week with a review of week 2! You can check out Country Heat here. Let me start by saying that I LOVE this time of year! This is not a “I hate sweater weather” post because I LOOOOVVVVEEEEE sweater weather. I am actually still highly anticipating sweater weather here in Alabama, haha! For the love, can I please wear flannel, boots and cardigans?!? This is also not me scolding anyone who has already done some of these things. This is me, a person who says yes to almost everything, practicing no. With that said, I just wanted to share a few things I am NOT doing this Fall in case another mom needs to hear that it is OKAY to not do everything. In fact, you CANNOT do everything! I don’t know about you guys, but Fall and the Holiday season is the time of year where I really struggle to say no to the ALL the pinterest ideas/lists/inspiration/expectations. Let’s take this list for example. Number seventy-five really makes me laugh. How in the world do you have time to actually enjoy this ridiculously long list?!?! Who has time to do ALL of these things?!?! ESPECIALLY people with small children?!?! FOR THE LOVE. Now, I know most people don’t have children 15 months apart like I do, but still. Come. On. So here is the my list of things I am saying no to this year. Hopefully it will encourage you to say no to a few things, too, leaving you time to sleep and just be! 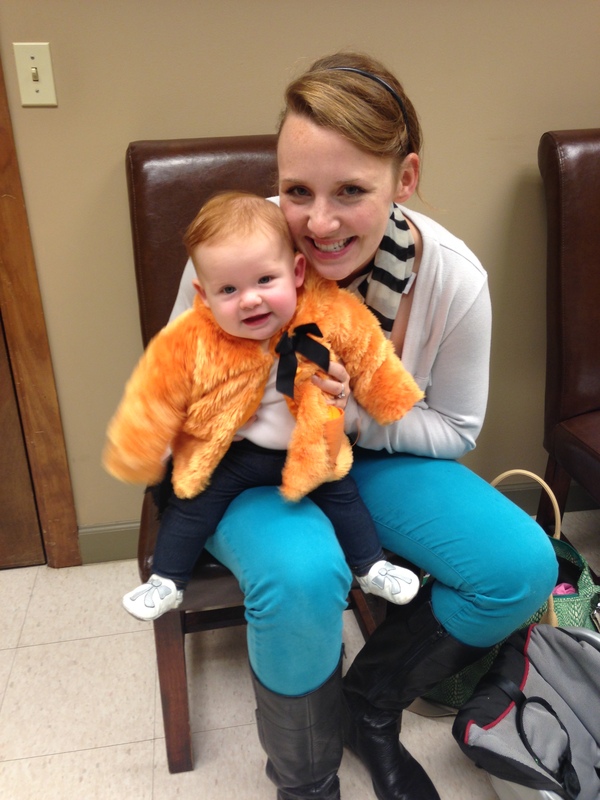 Fall Family Photos – we are skipping these for two reasons. First is because it isn’t in the budget. I know some families like to have professional photos done every season, but that’s not something we can accommodate in our budget currently. If you can save for retirement, save more money aside for “rainy day/crap happens,” save money for your children’s college/pay off your own student debt, pay all your bills, and still have money left for quarterly photos, by all means don’t let me stop you! I would gently encourage you to reconsider spending money on them if you can’t meet that list though 🙂 Another reasons is time. Wrangling a 2 1/2 year old and 1 year old to a photo shoot praying they stay CLEAN, in cute coordinating clothing, while also making myself look presentable upon said mini shoot arrival is an EVENT. Then, you have the actual PHOTO SHOOT! Half a day gone with two whiny toddlers in hopes for the perfect Christmas card photo. Yeahhhh….I am going to pass. Our Christmas cards (if I even do them this year) will have a photo from our Spring photo session, and I highly doubt anyone will actually be offended or even care that it’s the wrong season. Home made matching pumpkin shirts – this was a hard one to let go guys!! I made Reagan a cute little pillowcase dress last year with a pumpkin applique, so the mom guilt said I need to do it again for both children to keep things fair (mom guilt logic at its best). Because my one year old little boy is OBVIOUSLY going to be utterly devastated his entire life that I didn’t make him a pumpkin applique shirt. Totally. *Insert eye roll here* I know the only way these would get done is if I gave us some precious sleep, and I know in the long run me being grumpy for three to five days because I didn’t sleep isn’t worth it. Just buy them you say? Please see part of one of Family Photos. The word is budget. In eighteen years, my children will thank me that I said no to monogrammed, Holiday outfits and put money back for college instead. Pumpkin Carving – In no way shape or form is pumpkin carving a family affair with two young toddlers. It’s more like a family death strap, so we are skipping this entire event. I am sorry dear trick or treaters that we will not have a delightful carved pumpkin for you. Maybe in three to five years. Or ten. Maybe. I did however buy pumpkins and gourds for our dining room, and they are adorable. No carving required!!! DIY new fall wreath – Nope. I love crafting and creating things, but it’s a matter of prioritizing my time and right now crafting is not a top priority. Family + friends + working + commitments > crafts. I did, however, budget for a new fall wreath. Hobby Lobby and $30 did not fail me! 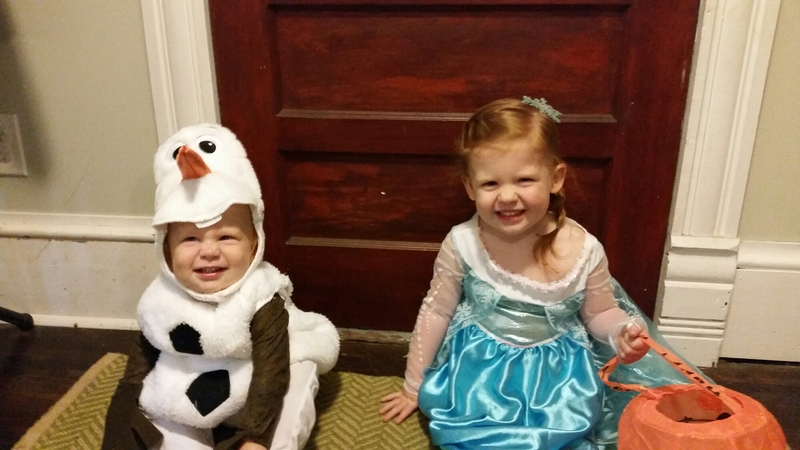 Family Halloween costumes – Ryan and I will not be dressing up this year. This was another hard thing to let go. I just came to terms with the fact that I didn’t have time to make them, and spending money on something that will be worn once was not money well spent. Our children will have costumes, and that in itself is a victory! Parents, feel free to rid yourself of the pressure of coordinating family costumes! I can hardly remember my parents EVER dressing up when I a kid. Shame on you Pinterest for making all parents feel as though they must all be wearing coordinating outfits every Halloween!! We managed last year, but this year I am letting it go. We are also saying no to a group Pumpkin Patch outing, two Halloween-ish parties, a corn maze, and a slew of other Fall events. We would be running ourselves (and our children) ragged trying to do everything. Also, sometimes you just HAVE TO DO LAUNDRY. YOU JUST HAVE TO. If you can afford to just buy new clothes, power to ya! Moms, feel free to LET SOMETHING GO! You deserve sleep. Your family deserves a mother with sleep. You deserve time with friends. You deserve a date with your husband. You deserve time to just sit. Enjoy the pumpkin patch. Letting go of these few trivial things has already helped me enjoy the things we are making a priority to do! You have permission to do enjoy that, too. I am so glad you are a part of our family! I love that I am your very favorite person in the whole world (except when I don’t enjoy being loved so much because I would like to use the bathroom without you crying). I love all of the snuggles (again, except when I REALLY need to use the bathroom). 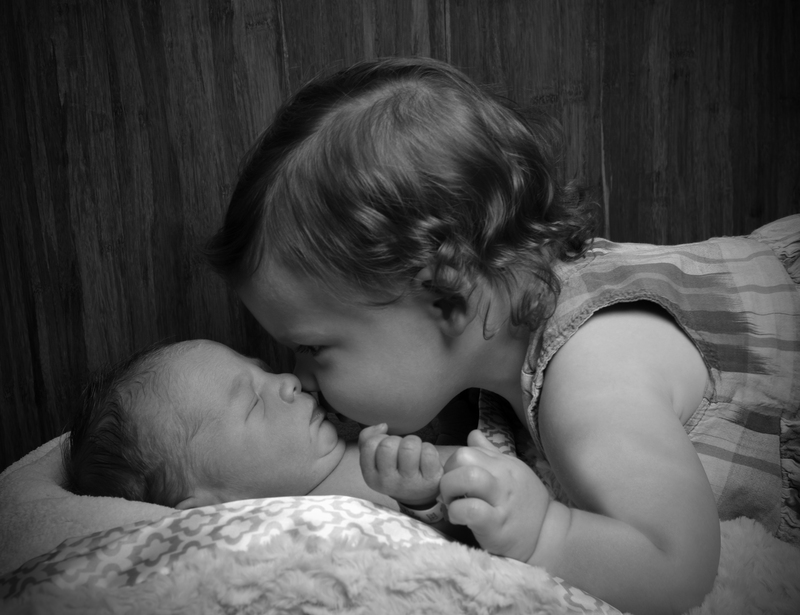 I love watching you and your older sister begin to play with one another. I love getting to watch you learn to do new things, like crawl and pull yourself up, even if it is earlier than your sister did and causes small panic attacks. I love that you are already so different from your sister, and I can’t wait to see what kind person you will be like one day! Not only are you different than your sister, but I am a slightly different mom to you than I was your sister. For that, I would like to say I am sorry. I am sorry for the lack of “official” photos. With your sister, I started strong with WEEKLY photos in the same white shirt/onesie on the same adorable quilt. For you, I have EPICLY failed to even capture monthly photos. Forget about the same shirt. Your clothes probably aren’t even clean in the picture. Of course, of the picture I do have there is a good chance your sister is also in them. Again, so sorry buddy. I am sorry that you have to cry a little more to get my attention. It’s not that I enjoy making or hearing you cry. It is just that the toddler crying and whining and disciplining needs to be addressed first a lot of times. There are also times when I just really need to use the bathroom. I do not have the ability to hold my bladder like I did with your sister. I have also learned that babies will not die if left to cry for an additional thirty seconds, but I WILL pee on myself if I don’t go to the bathroom NOW. Sorry buddy. I am sorry I didn’t lay on the floor talking to you during tummy time like I did your sister. I was too busy making sure the toddler didn’t step on you, lay on you, sit on you, feed you goldfish, smother you with blankets, choke you with unwanted pacifiers, or wallop you in the head with wooden blocks. Sorry buddy. I am sorry your room still isn’t completely finished. I know you are obviously traumatized as a nine ten month old by this. I was busy. It hasn’t killed you yet, so it is still unfinished. Maybe you should cry more about it. I am sorry you have to wear a pink swim hat at the pool because you get hand-me-downs occasionally from your sister. I have just realized more that no one really cares if my son wears pink because I choose not to spend money on something when I have a perfectly good *insert ABC or D here* but it just happens to be in a society-dictated girl color. I am sorry I didn’t read 47 books on how to care for your second child before you arrived. I didn’t read a single book. I am not sure how I have manged to parent without all of the “experts” advice this time. I am sorry I didn’t not spend two months researching and planning out what your first food would be, nor did I make you any homemade baby food or special Baby Led Weaning, perfectly sized, healthy spinach and egg muffins. Instead, I put a Pea Crisp on your Bumbo tray for entertainment during lunch thinking you wouldn’t possibly actually get it into your mouth because you weren’t that coordinated yet. Then, only moments later do I see you immediately stick said Pea Crisp into your mouth and smile with joy. I am pretty sure Reagan didn’t get anything processed for a solid three or four months after starting table food, and your first food was a glorified potato chip. You are welcome. I am sorry I don’t panic and run every time there is something in your mouth. I sweep the kitchen daily and vacuum two or three times a week, but there is always food on the floor thanks to your sister. I just pray it is food and move on. So far you haven’t choked or been close to death, so it goes in the parenting WIN column. I am sure mulch is good for the gut anyways. I mean, it’s all natural! I am sorry I exercise daily now instead of just a jog with the stroller two or three days a week. I am sorry those workouts aren’t always baby wearing friendly as you would like. I try to do them before you wake up, so if you would just sleep until 6:30 everyone would win. The baby weight after you were born required a lot more effort to get gone. 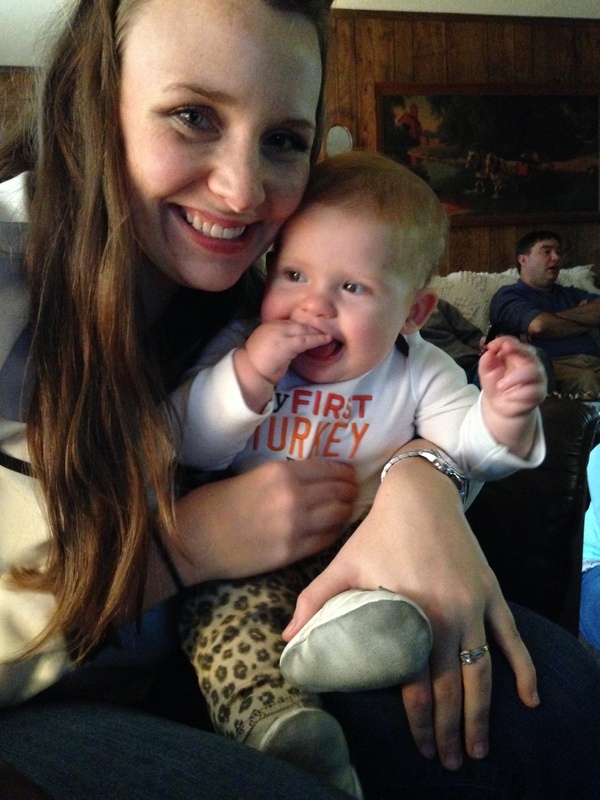 Eight weeks postpartum, and I was down a very depressing eight pounds. 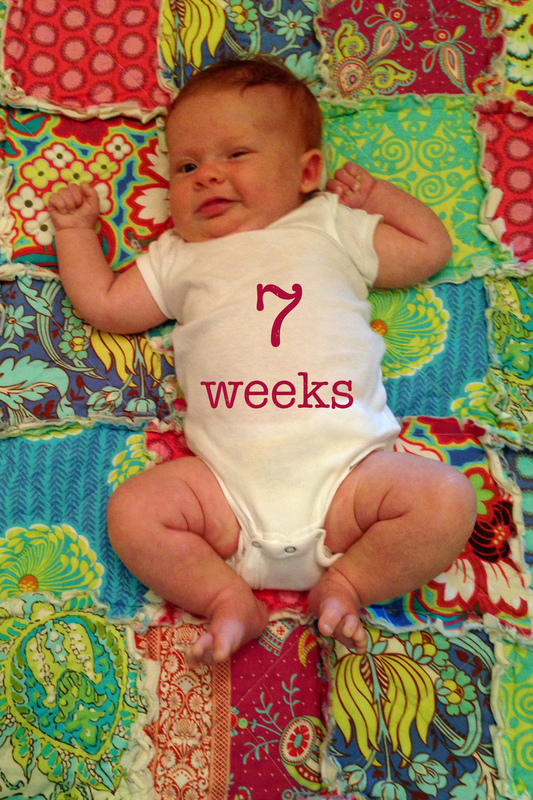 You weighed seven pounds and fifteen ounces, so thanks for that. I am sorry one of your 1st Birthday gifts is going to be the gift that I fully intended to make and give to Reagan for her 1st Birthday, but didn’t finish in time. You can get mad at me later about that one. Fair enough. There is one thing I am not worry about – the fact that you are SO loved and adored by us and your sister. Sure, you have absolutely no idea how to entertain yourself because Reagan does that for you, but SHE LOVES YOU!! You will always have a protector, a playmate, and a forever companion. 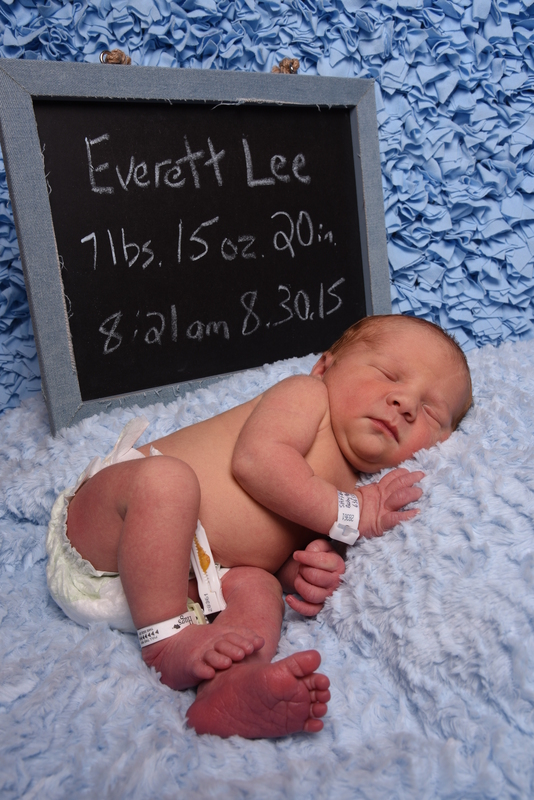 For that you are very welcome, Everett! Does this thing still even work? I guess we will find out! 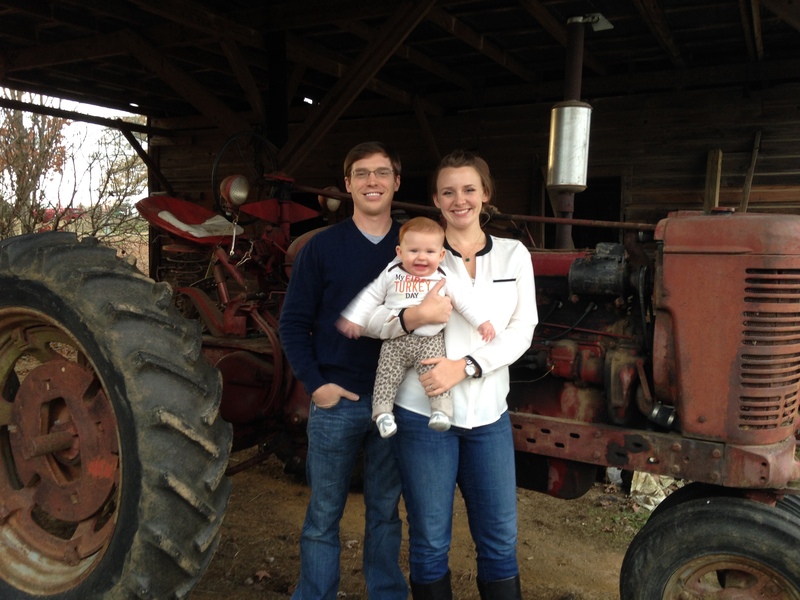 Well, Reagan just turned two and Everett is now eight months old…and we are STILL ALIVE YALL! 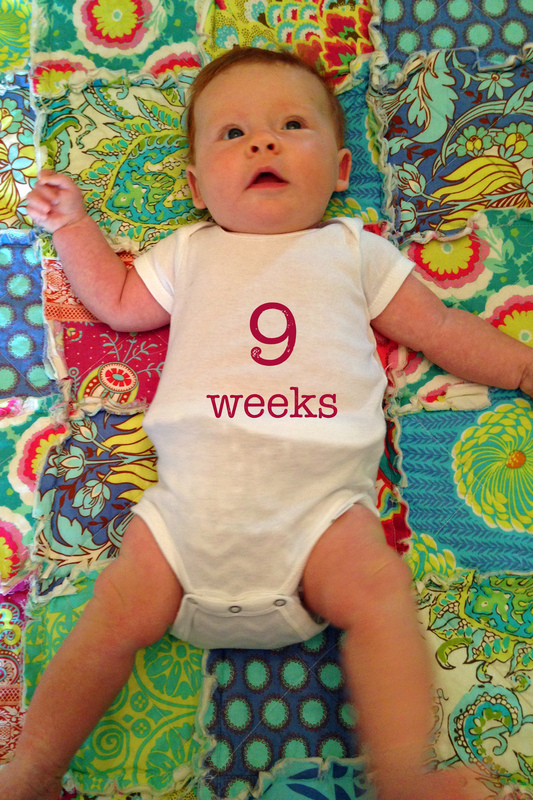 We have survived eight months of two under 18 months (16 months if you want to get technical) thus far. 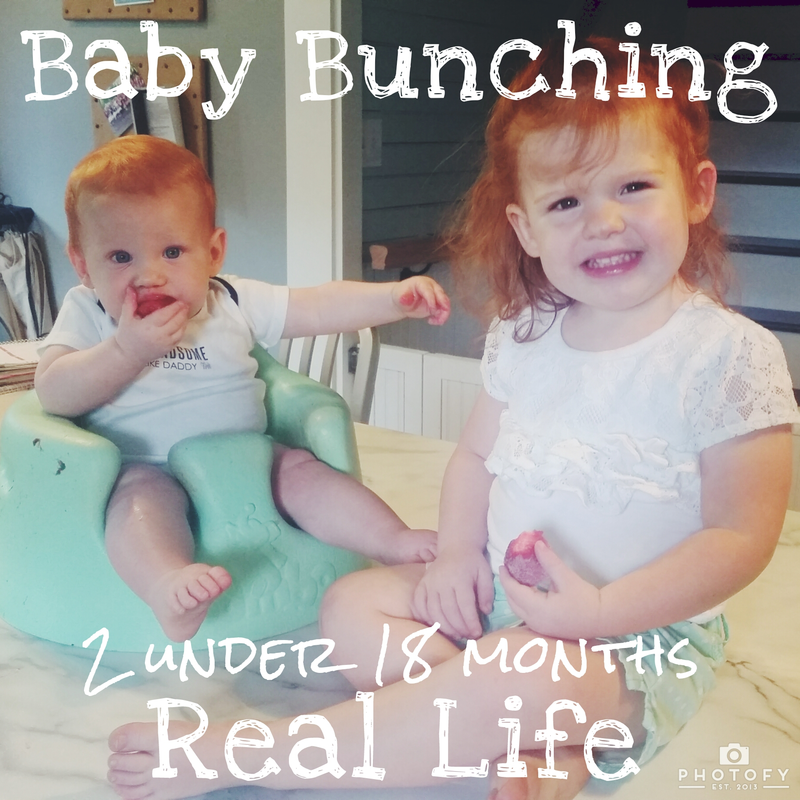 We fall into an elite group known as “baby bunchers” referring to families that have two children less than two years apart. I remember when I found out we were expecting again, the first thing I did was try to find other baby bunchers on line. I scourged the internet for a blog, website, Facebook group, ANYTHING that might be of help. I desperately wanted insight into the day to day life of two so close together. Honestly, I didn’t find much and I was sort of surprised by that. And annoyed. I felt as though my fellow millennials had failed me. Now, I understand. Moms with two children so close together are BUSY! I would like to apologize to every blogger, abandoned Facebook group page, and website that I found and left frustrated by the lack of updated information. I now realize that you are too busy to sit down and write REAL thoughts! My apologies friends. With that said, I want to share a few thoughts for others who may be in my same shoes that I was a year ago. First, I have survived. You will survive, too! Honestly, the age gap is scarier than it sounds. I really thought the first three months were going to be the worst of it. Now that Everett is crawling, I have changed my mind. Having two fully mobile children running in two different directions will the hardest. Yes, the first three months are going to be tiresome. 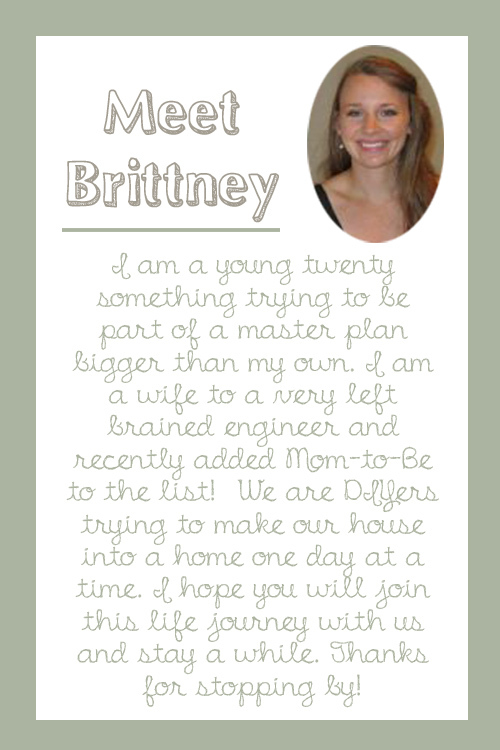 It is a transition for everyone – you, baby, toddler, husband. I would highly recommend your spouse or significant other takes TWO weeks off it possible. Physically, you will bounce back faster this time (I did anyways), but you also have a young toddler under foot who is used to being the center of the universe. This is where Dad comes in. 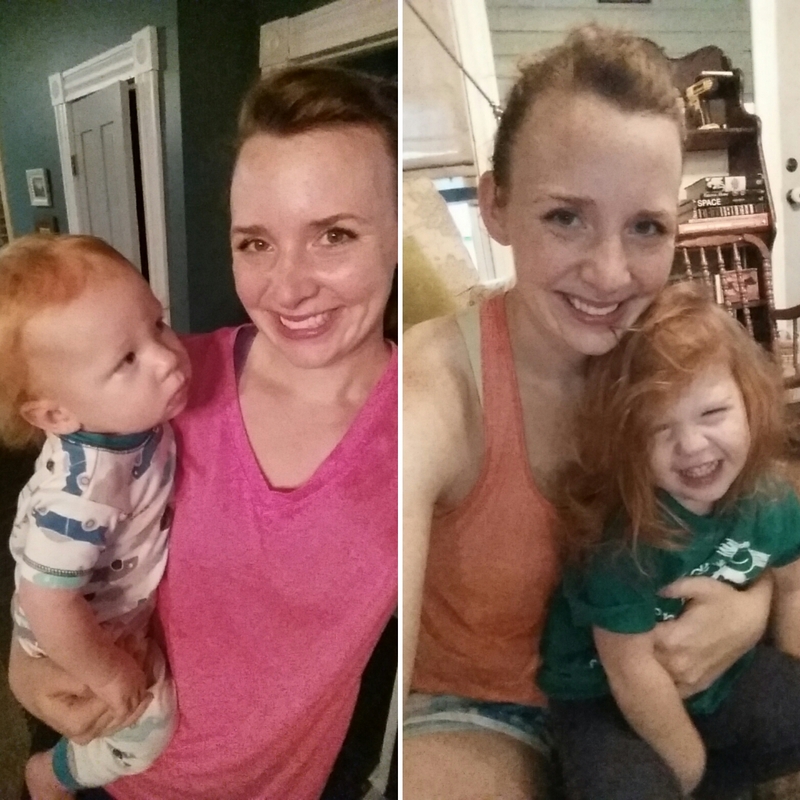 I took care of baby and myself for the most part and my husband handled the toddler. We were lucky enough to have my mom stay with us the first night or two and lots of friends and family helped keep us well fed the first few weeks. It was SUCH a blessing! One of the nicest things about having children so close together is that you haven’t forgotten much yet. You still remember how to feed a baby. 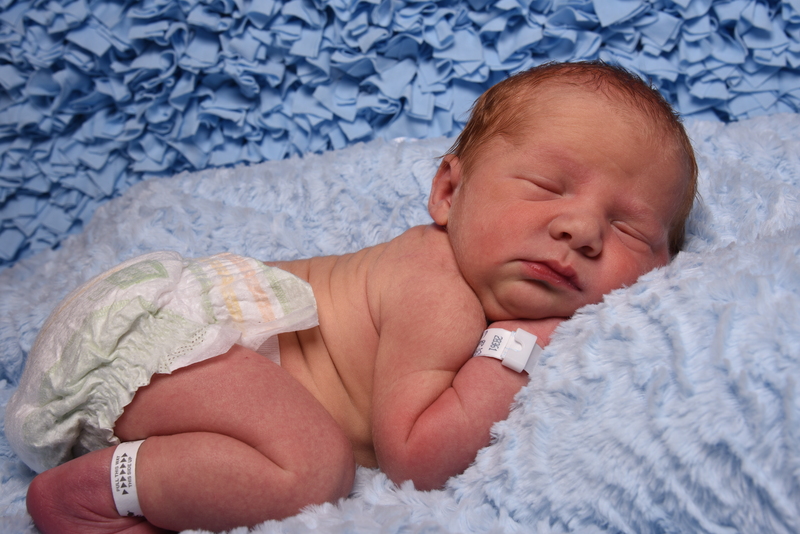 You remember how to swaddle and change a diaper. There isn’t a re-learning curve, which I enjoy. Actually, now the thought of having a baby and one in school sounds much harder! It only took all of two days to learn that all babies are different, including the ones you give birth to. For example, Reagan slept pretty well in our bassinet. 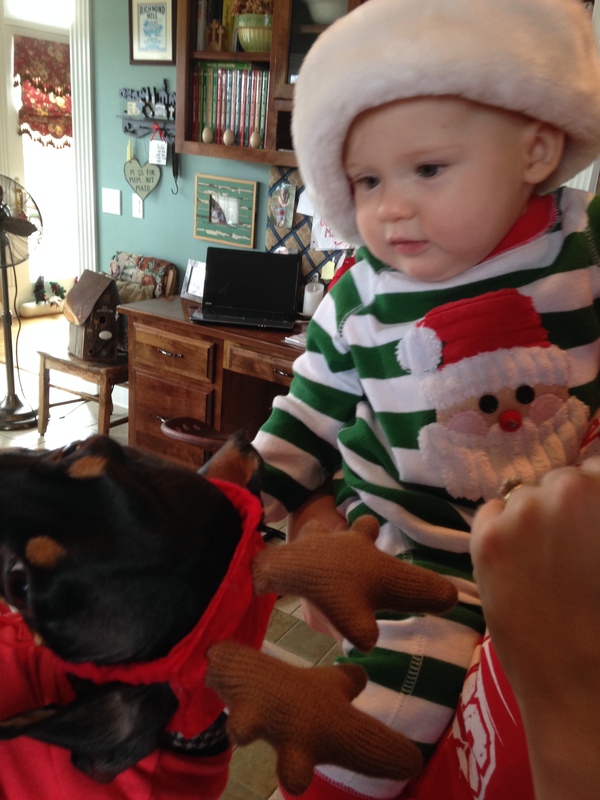 Everett hated it. HAAAATTTTTTEEEEEDDDD. IT. We ended up co-sleeping the first 8 weeks or so because it was the only way any of us got some rest. Another difference between your first and second child is how much more you trust your mom instincts. I was WAY too nervous to co-sleep with Reagan at that age! Around 8 weeks we transitioned him to a rock and play, and by 3 months he was starting to at least start off sleeping in his crib. Everett also followed a different eating pattern. I nursed on demand with both, but those first few weeks with Everett, on demand was more like just feeding him ALL the time. He just kind of grazed ALL day the first 2 months. Reagan was a textbook, every 2 hour eater. One thing I had been really worried about prior to Everett’s arrival was how to entertain Reagan while I was nursing. Honestly, I made this to out to be a bigger deal than it was. I had really great intentions of creating a “nursing basket” with “special” toys and books she could have while I was feeding Everett. Yeah….that didn’t happen, but it wasn’t really needed anyways. Thankfully, we didn’t have any jealousy issues. 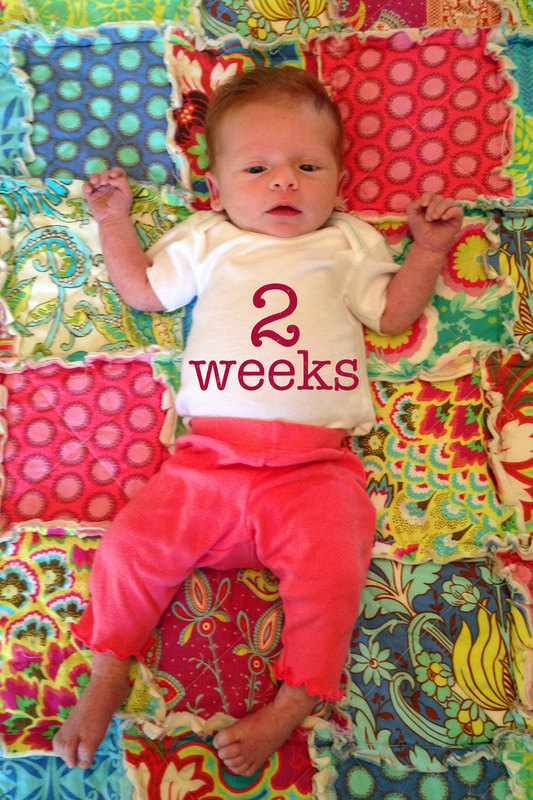 I usually only had to entertain her for 2 – 3 feeding during the day. I rotated between TV time, reading books and playing on the floor with her. It wasn’t the most comfortable nursing position, but it worked. Another thing you learn to do with your second, nurse on the go! Nurse anywhere. On the floor. In the bathroom. With a toddler in your lap. 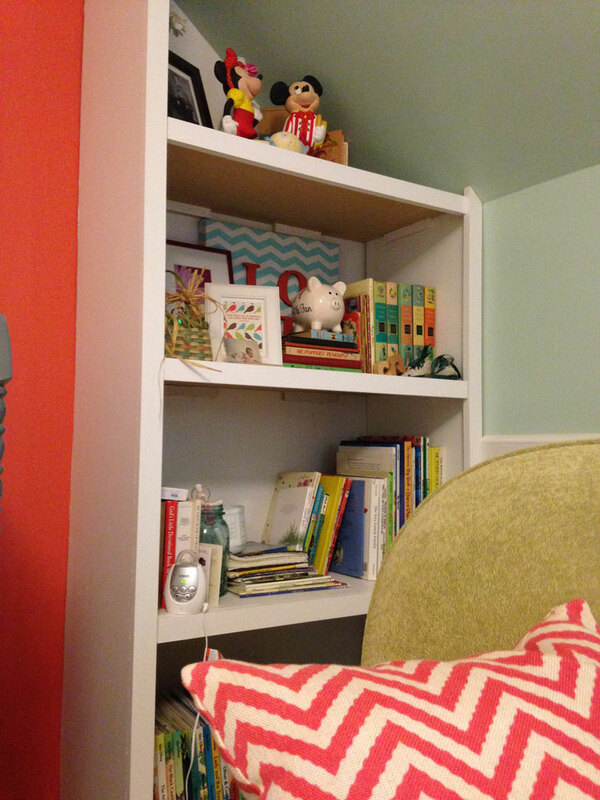 Gone are the days of settling into your “nursing chair” staring at your sweet newborn. You nurse anywhere and everywhere. As long as the toddler isn’t making a mess and the baby is eating, you are wining! Now, our first real outing was terrible. By “our” I mean just myself and both children. I was feeling pretty good about the whole thing, so I decided to go to Target to get a few things. I mean really, who doesn’t love Target?! Anyways, I plan this outing in the morning so Reagan will be pleasant and Everett will be sleeping. Home in time for lunch. I got this. In true toddler fashion, Reagan sleeps in an hour later than normal, throwing off the entire schedule. I rally. We are still going to go. I get everyone changed and ready (45 minute process). I am planning on being back home around 12:30-1 in time for lunch instead of 11:30-12 since Reagan slept later. BAD DECISION. We are halfway through our Target list when Reagan runs out of snacks (approx. 11:30). She is now whining and reaching for EVERYTHING on the shelves because she is “starving.” In toddler land, sleeping late and therefore eating breakfast late does NOT mean lunch should be eaten late. In the midst of her whining, she wakes up Everett. Also, in my attempts to keep her quiet, our short Target list has taken at least twice as long as it should have. I hustle to get checked out before Everett realized he is hungry. Of course, the minute we get in line he realizes he, too, is starving and needs to let the entire world know that he may die of starvation! The cashier didn’t seem to hear him or wasn’t capable of working at a normal human speed. I felt like she moved in slow motion, like the sloths in the zoo movie previews. Both of my children are now crying/screaming. I want to cry, too. The cashier is asking me the DUMBEST QUESTIONS EVER. WHY ARE YOU ASKING ME STUPID QUESTIONS?! PUT THEM CLOTHES IN THE DAMN BAG WOMAN. NOW! I didn’t actually say that, but I wanted, too. Seriously lady. Do you not see the melt downs happening? Please, for the love, go faster!!!!!! We finally get out of the store and to the car. I get Reagan buckled into her car seat. I go to get Everett out of his car seat to feed him when I find POOP. EVERYWHERE. Him. Me. Clothes. Carseat. Total poop blow out. Reagan is now screaming. Everett is still screaming. I clean him up and his car seat out the best I can, feed him, Reagan falls asleep in her car seat while waiting, and then I put Everett back in the car seat so we can go home. Whew. We lived. Over all, having two so close has its hard moments – when they both need you at the same exact moment, when they both get sick (also at the same time), logistical struggles sometimes of cart vs. stroller vs. baby wearing vs. walking vs. every combination of those. BUT for the most part if is just BUSIER. You no longer have the luxury of resting for a few minutes while the toddler naps because you now have an infant to take care of. This also means less gets done around the house. I have come to peace with that. This is a stage of life where the floors will always be dirty. I can sweep twice a day and still step on a cheerio or raisin, but it won’t be like this forever. It is already going by way too fast. *Clears throat* Anyone still there? It has been a good…uh… I don’t know….6 months or more since my last blog post. I honestly do not know where 2015 has gone. I swear it was just Christmas, like day before yesterday, which also happens to be the last it I blogged! Ha! 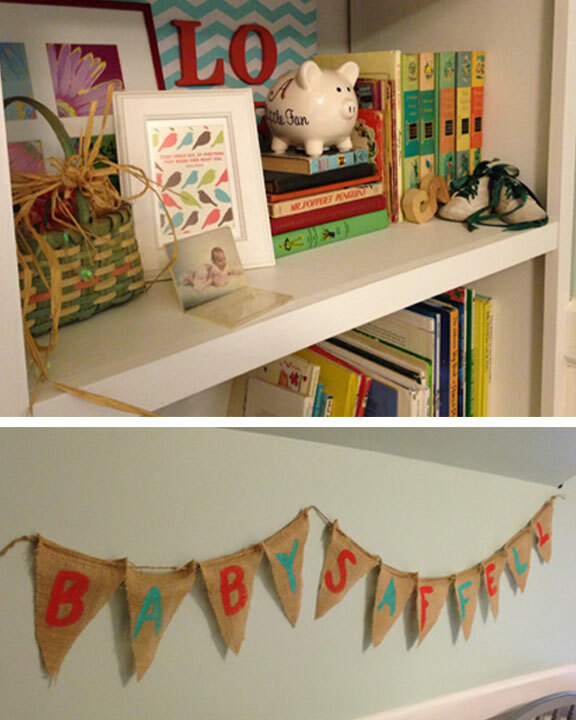 In the past several months we have made a few changes around the house. All of those changes revolved around one key person. 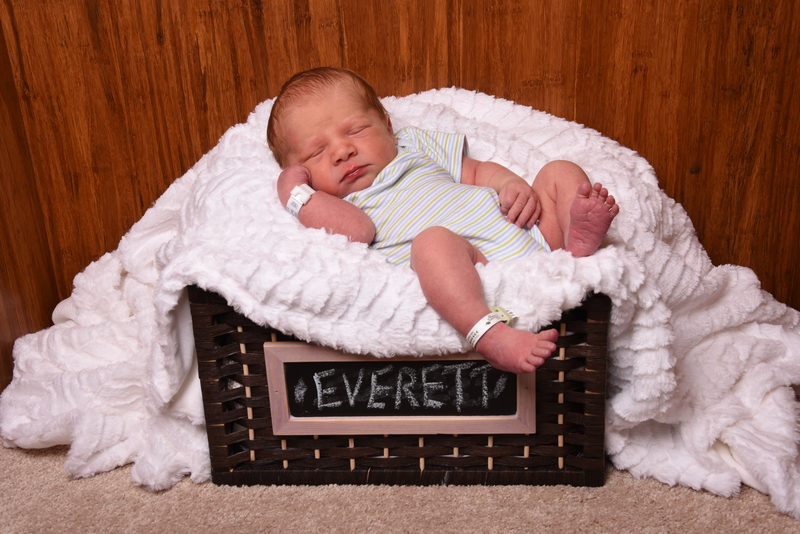 In all seriousness, Everett is a huge blessing and a delightful baby (when he isn’t gassy, gassy Everett is kind of a jerk). When we found out we were expecting again, we were slightly surprised, very excited, and a little terrified. I did what probably every pregnant woman does and wrote a gigantic and completely unrealistic pre-baby to-do list. I even went as far as breaking it down week by week to keep us on track. I am going to blame the nesting hormones even though you and I both know that is a lie. Since Everett’s arrival, the question I get most often is, “How is Reagan doing?” I can confidently say she LOVES her brother. 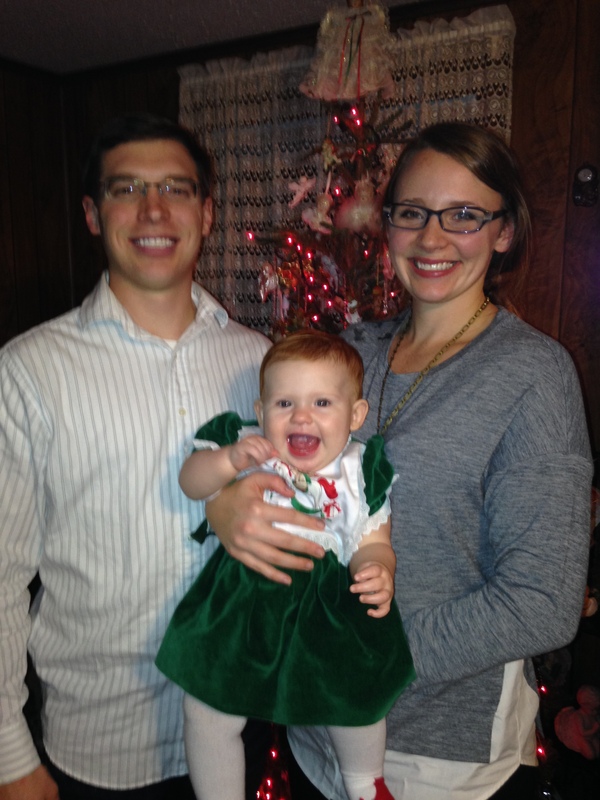 She was just shy of 16 months when he was born, so Ryan and I weren’t sure how aware she was really going to be. 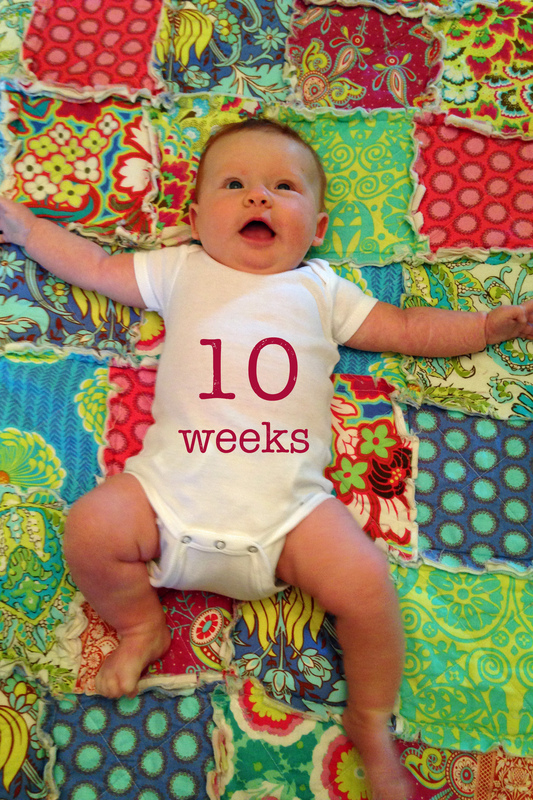 We are now ten weeks in, and she is still doing great. Everett is not deprived of affection in the least bit. She is constantly giving him hugs, kisses and head pats. She also makes sure he has his paci and blanket at ALL times. It is pretty much the most adorable thing ever! Trick or Treat, Happy Thanksgiving, and Merry Christmas! Duuuuudddeeeee. Where did the last of 2014 go? Seriously? Time is just whizzing by these days. So, lets catch up, shall we? The original plan was for the three of us to dress up in a Peter Pan theme. Ryan would be Peter Pan, I would be Peter Pan’s shadow and Reagan would be Tinkerbell. 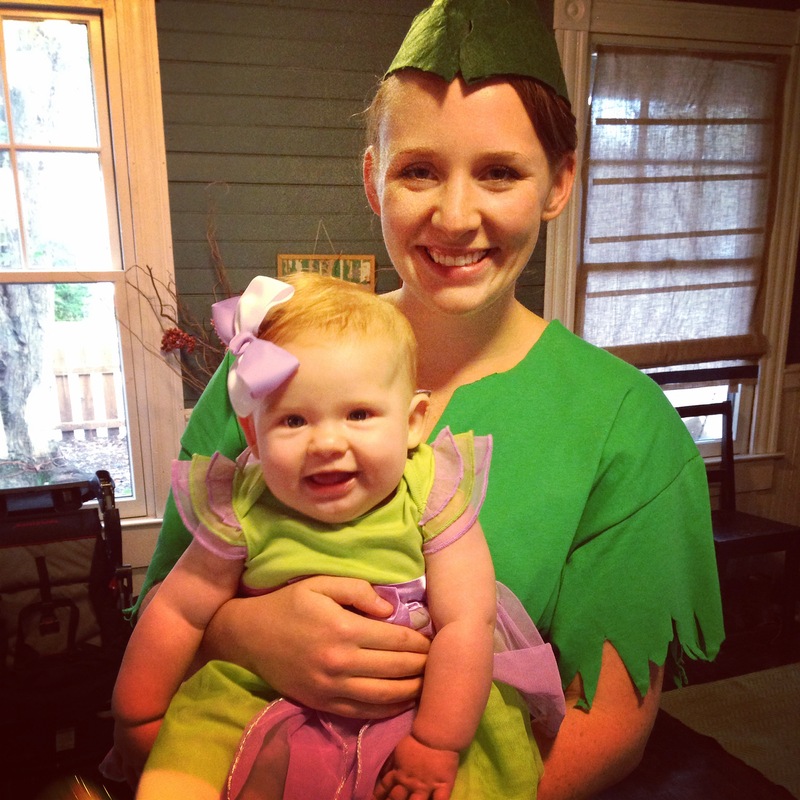 Well, Ryan got sick right at Halloween, so I decided that I would look really silly as a shadow with no Peter Pan, so I took on Ryan’s role as Peter Pan and took Reagan to our Sunday School costume party to show off her Tinkerbell outfit. Thank you Disney Outlet! We spent Thanksgiving with my family this year. Most of my family is close by, so it’s not too crazy of a day for us. We have one Thanksgiving meal for lunch and another for dinner, both in 30 minutes of each other (yay!). 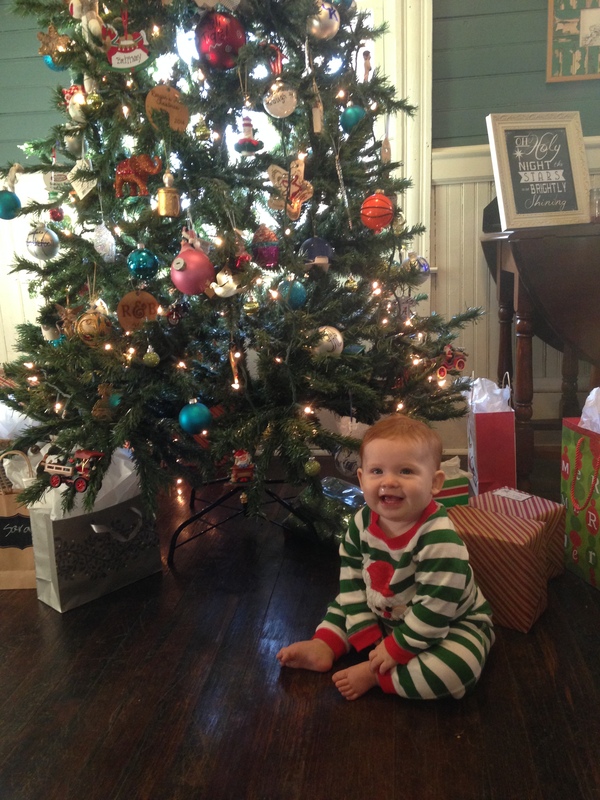 Reagan’s first Christmas was so fun! She loved eating wrapping paper and playing with tissue paper more than most gifts, but she has come to enjoy a few new toys as well. Thankfully, we were not overwhelmed with toys. 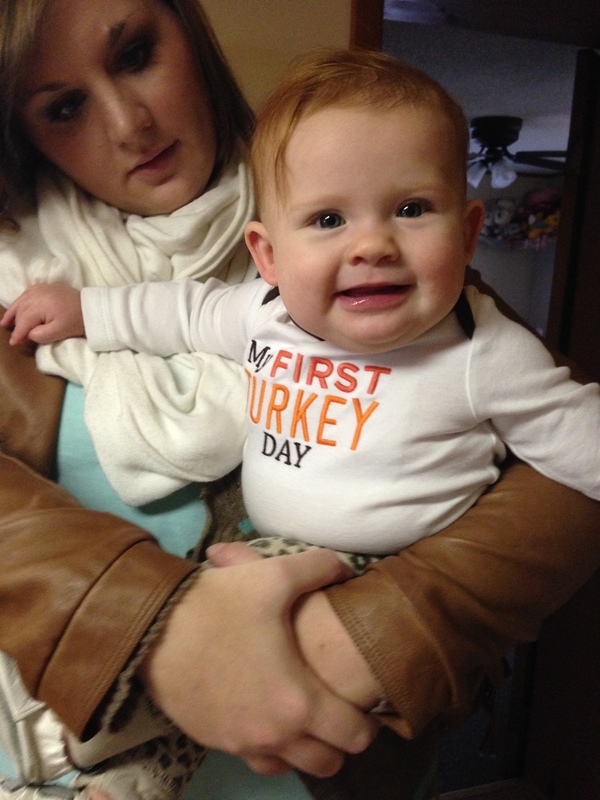 She was also in a great mood all day!! Mood is always questionable with an infant when his/her schedule is out of rhythm. Overall, we are blessed with a happy, even tempered little girl. She is so good sometimes it is weird. Our second child will either be the Devil himself or Reagan will turn against us as a teenager, mark my words. Well, now that we are kind of caught up, what is new with you guys? I am hoping to get back in the a blogging rhythm, but I have been saying that for months and here we are 🙂 I am also hoping Reagan will start taking longer naps soon which will help! Fingers crossed! Lastly, believe it or not but we have made some progress around the house with a few things! I will do a quick recap next time on things around the house. Happy New Year and Roll Tide! Hello????? Anyone there???? Hi, nice to meet again! Anyways, Reagan’s room is 97% done! One window valance left to make and two more frames to hang on the gallery wall, but it is done enough! Without further ado…. 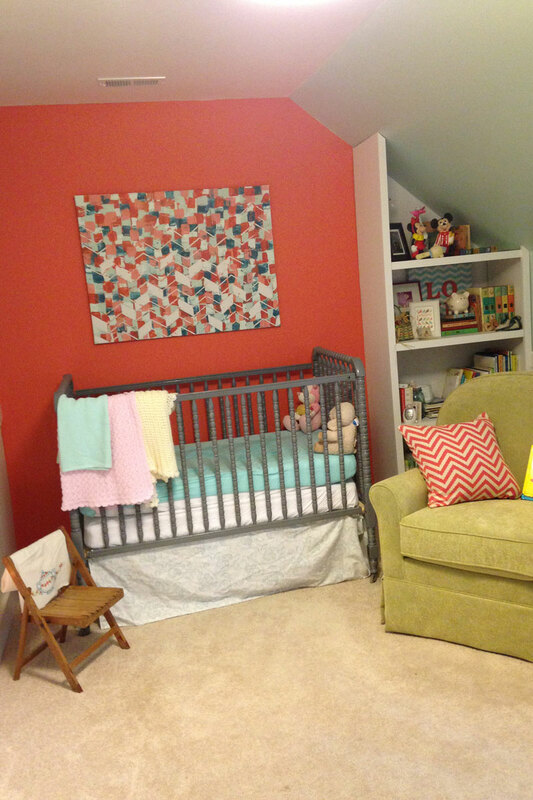 We wanted to something different than the typical baby pink girls nursery, so we went with an aqua and coral color scheme with white and apple green accents. You can see our original plans here. The crib was purchased at a Yard Sale for $10 (thanks Mom!) and given a fresh coat of primer and grey spray paint. *FYI – painting a Jenny Lynn crib requires 5 cans of spray paint* We modified the crib, so the front no longer drops down. I made the bed skirt with fabric from Sir’s in Fayetteville and followed Young House Love’s tutorial. The small child’s folding chair was a $25 find at a local antique store (Firehouse Antiques for you locals). Ryan built in the bookcases and the glider was a generous gift from my parents. The painting was actually a left over canvas from when we were staging our old house. I had planned on painting something for our dining room, but our house sold so quickly that I didn’t have time to finish it! Recycling for the win! 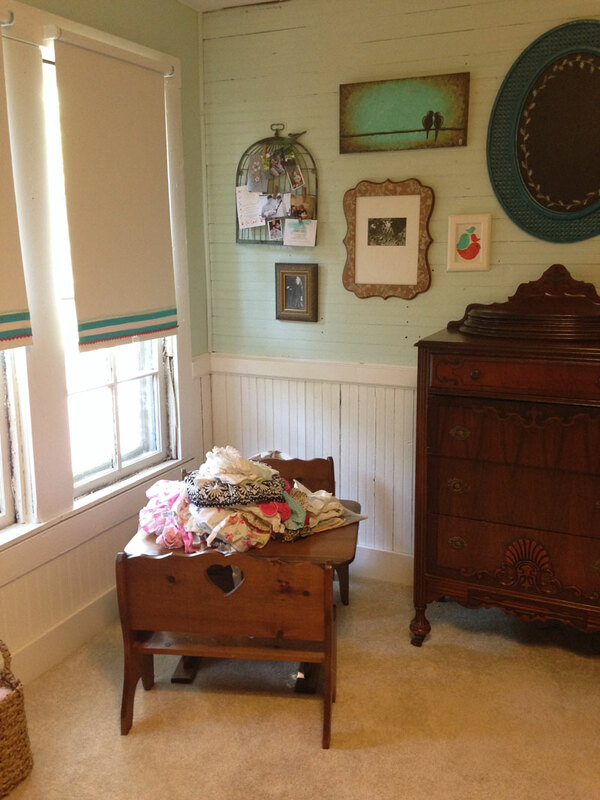 The changing table was a $20 Goodwill find that also received a coat of grey spray paint. All of her diapers, bath supplies, swaddle blankets and burp cloths are organized there. The baskets came from a variety of places such as Target, antique stores, and Hobby Lobby. The banner was a home made gift from my sister. 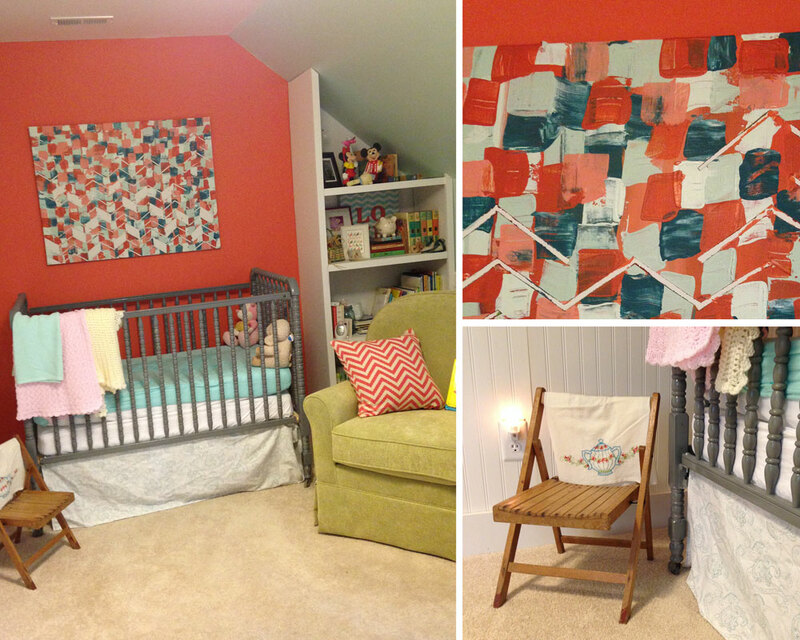 Reagan’s nursery is the smallest bedroom in our house – roughly 9’6″ x 15″. 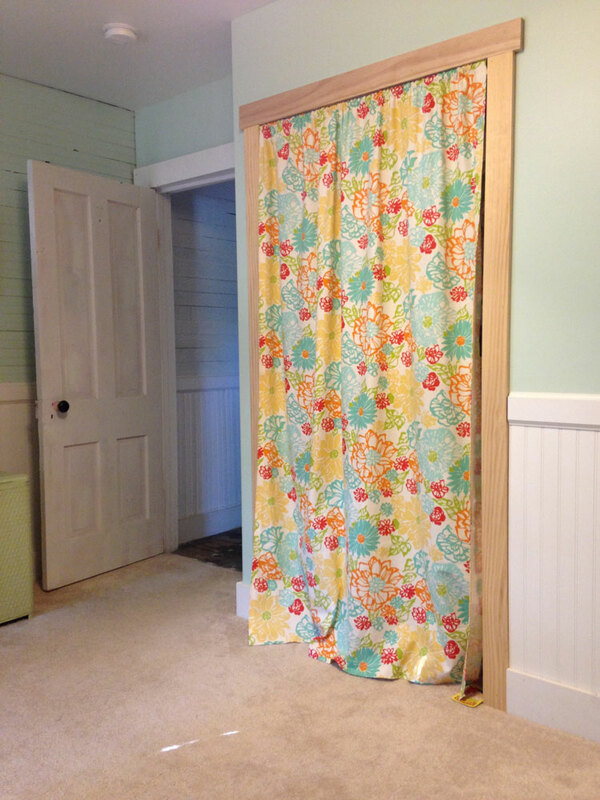 We like that she has a lot of floor space right now, so instead of adding a closet door that swings into the room, we opted for a curtain (fabric also from Sir’s). One day when play space isn’t really needed, we will probably add a door. 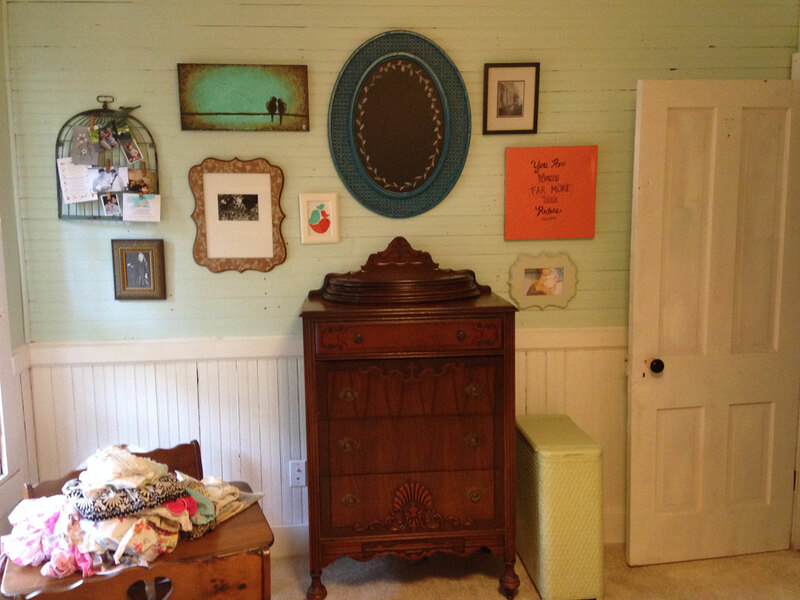 The dresser was actually mine from college – probably my very first furniture purchase. The wooden table was actually mine from when I was little. My brother even left his mark by carving his name in the table! The pile of clothes on top are all the clothes Reagan has already out grown that need to be boxed up! The collage is a collection of things we already had with a few new additions, some handmade and some purchased. I still need to hang two more frames on the wall. The roller shades are from Ikea. I just added some decorative trim at the bottom. I have coral fabric to make a valance for the window, and one of these days I will get around to making the darn thing. One day. So there you have it! I hope you enjoyed Reagan’s nursery tour. Ryan and I were very excited that we came in under our $500 budget – bead board, baseboard, chair rail, paint, furniture, fabric, built-ins, closet, window treatments, and decorations. 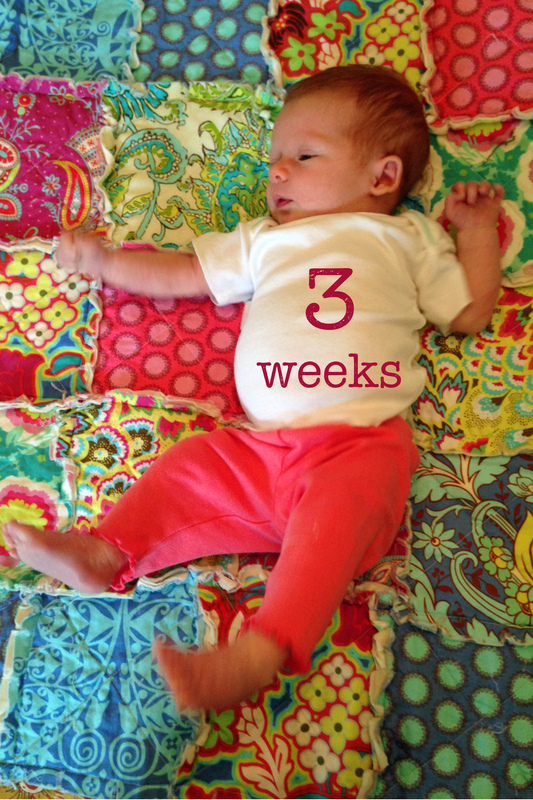 And just a general update on Reagan – the girl is growing like a weed! 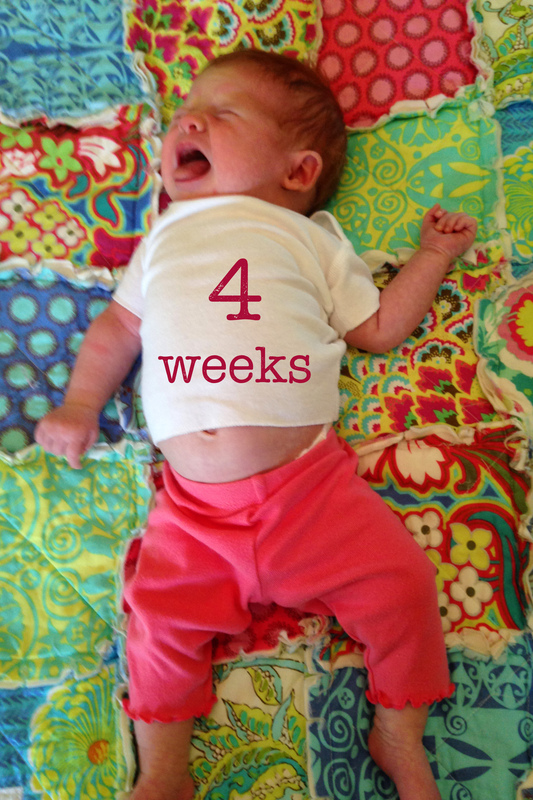 At her four month check up two weeks ago, she was 17 lbs 10 oz and 25 1/2″ tall! That puts her in the 97 percentile and the size of an average 14 month old. 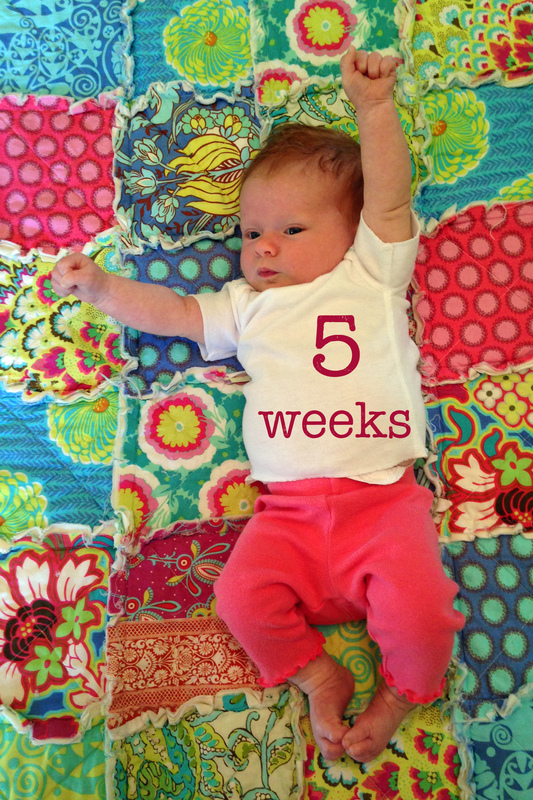 She is a big, healthy, happy baby – and bonus – a pretty good sleeper! 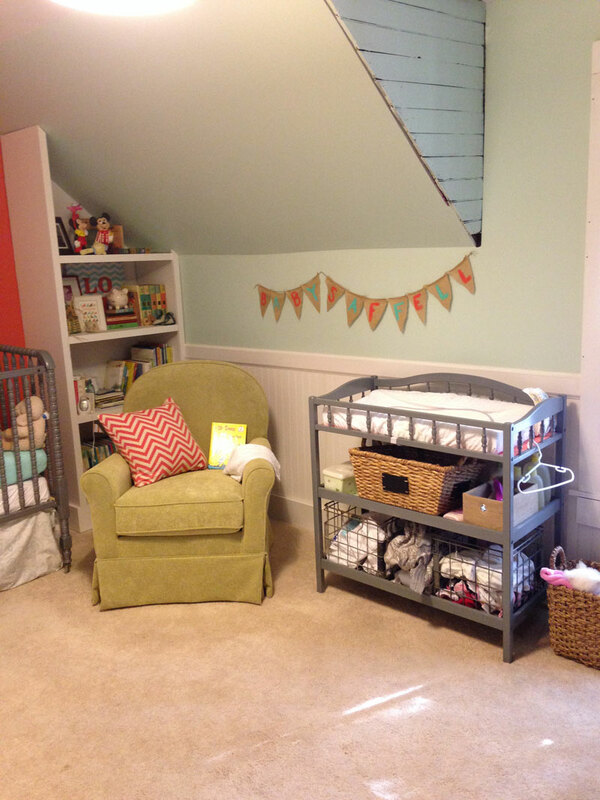 I promise I will show you her nursery next. I have three TINY things I want to wrap up on her gallery wall, and I just need to take the 30 minutes and get it done. Soon! Anyways, I wanted to share Reagan’s photo project with you guys. I have been taking her photo every week on the same quilt (thanks Mrs. Kim!) to see how she changes. I am planning on taking her photo every week for the first year. 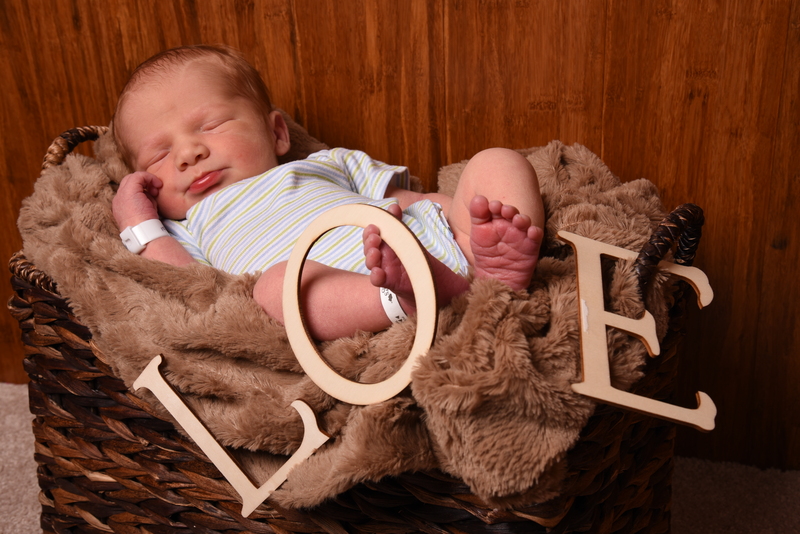 The idea originated from Young House Love‘s photo project with their daughter Clara and their new little man. I decided to just use the same quilt as a back drop to keep the pictures consistent. I am hoping to make some sort of collage when all is said in done! 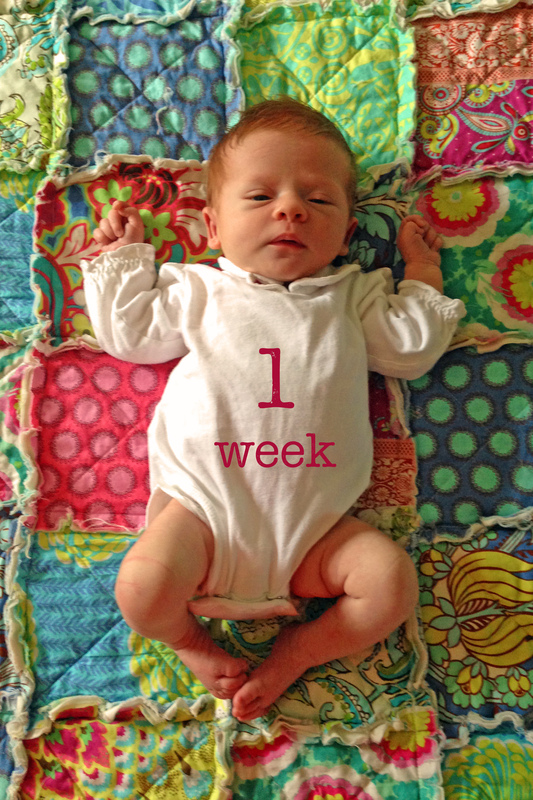 Reagan will be twelve weeks old tomorrow!!! I would really like to know who stole my infant and replaced her with this giant almost fifteen pound baby who can hold her head up, hates being held like a baby,sleeps 6-7 hour stretches at night and has already rolled over once! EEK! Enough chit-chat. You are just here for her pictures, so…. let’s start with week 1. So tiny! Look at those skinny little legs! 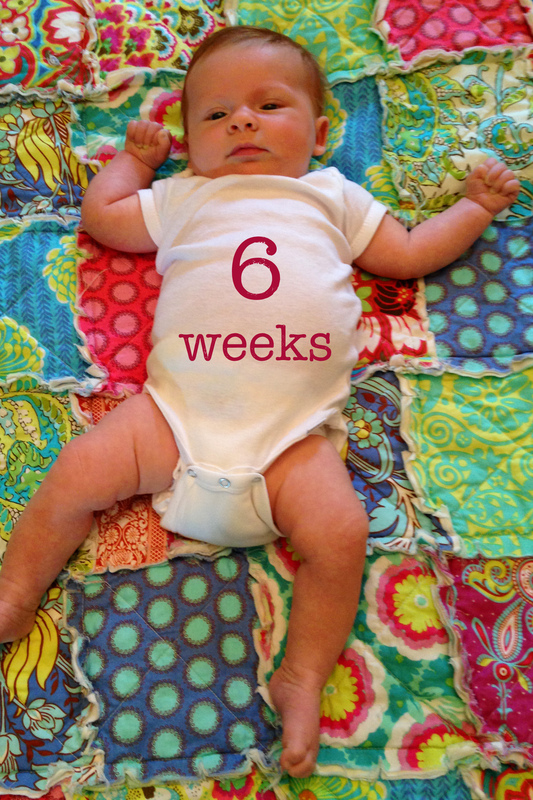 We switched to our “big girl” cloth diapers at 8 weeks old. Reagan and I both prefer them to disposable believe it or not. 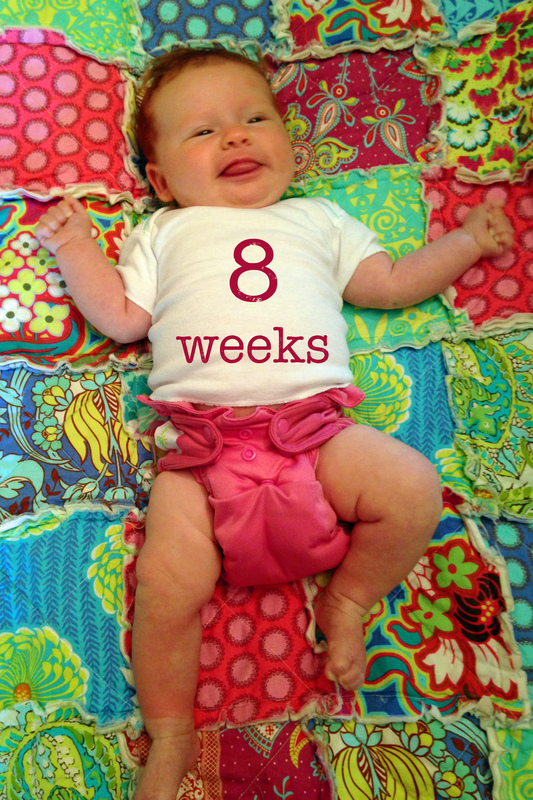 With disposable, she HATED having AN OUNCE of pee in her diaper, but with cloth she will wear them for two or three hours without fussing. 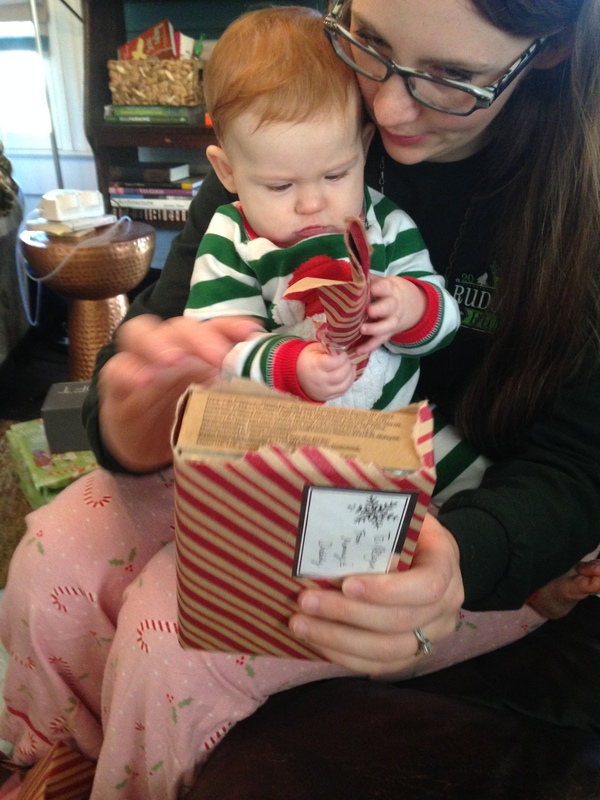 We decided to use Bum Genius diapers and bought (and were given) enough to last two days. I wash a load every other day, so it’s really not bad at all. Cloth diapers for the win! I created a separate page for Reagan’s picture project. You can see the tab at the top next to House Tour. I will continue to add her photos there instead of a separate post for each photo. I will try to update that every few weeks with new photos! Hope you enjoyed seeing how much she has changed over the last few weeks. Miss a recent post? Catch up here!